The Blaine County Sheriff’s Office is investigating the death of a jail inmate who fell Friday onto a concrete floor from a second story cell walkway, suffered a severe head injury and was pronounced dead Saturday at a Boise hospital. Sheriff Gene Ramsey believes that 23-year-old Mitchel Wayne Christensen intentionally jumped from the top of a second-floor rail. He fell 13 feet. Christensen’s death would be the third suicide at the Blaine County Public Safety Facility, which houses the jail, since the facility opened in 2008. Christensen, of Buhl, was living in the Wood River Valley in December when he allegedly faked a robbery to cover up a theft he committed at his place of employment, the Base Camp Fuel convenience store on Warm Springs Road in Ketchum. He was facing a felony charge in Blaine County of grand theft and a misdemeanor charge of providing false information to police. Christensen was released on bond in January. Ramsey said Christensen was returned to the Blaine County jail on Thursday, June 12, on a failure-to-appear warrant after being arrested in Twin Falls. In addition to the Blaine County charges, Christensen was a suspect in a series of pharmacy robberies in the Twin Falls area, in Blackfoot and in South Ogden, Utah. 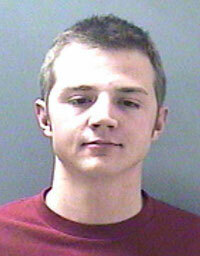 Ramsey said Christensen jumped from the jail’s Cell Block 500 second-floor rail at about 6:15 p.m. on Friday. Fire Chief Bart Lassman said Christensen was in critical condition when a Wood River Fire & Rescue ambulance arrived. He was transported initially by the department to St. Luke’s Wood River south of Ketchum and taken from there by air ambulance to Saint Alphonsus Regional Medical Center in Boise. In addition to his own investigation, Ramsey said Christensen’s death would be investigated by an as-yet undetermined outside agency. He said results from both investigations will be forwarded to the Blaine County Prosecuting Attorney’s Office for a final determination. Ramsey said he’s confident the determination will be suicide. Christensen’s trouble with the law in Blaine County started the evening of Dec. 12 when he reported that he was robbed by a “Hispanic male” who entered Base Camp store while it was closing, assaulted Christensen, leaving visible facial injuries, and fled with stolen money. Ketchum Police Chief Steve Harkins reported in January, however, that subsequent investigation showed that Christensen faked the robbery, intentionally injured himself and stole about $2,000 in cash. Christensen was arrested on Jan. 21 but released from jail later that day after posting $10,000 bond. He pleaded not guilty to both the grand theft and providing-false-information charges when arraigned in Blaine County District Court on March 10. A jury trial was initially scheduled to begin on May 7 and was later rescheduled for Sept. 9. Court records show that several warrants, alleging violations of the terms of his release from jail, were issued for Christensen’s arrest following his court appearance on March 10. The latest came on June 9 charging him with failure to appear at a court hearing and setting bond at $500,000. Twin Falls County Prosecuting Attorney Grant Loebs said Tuesday that Christensen was arrested on June 11 on the latest Blaine County warrant. Also, Loebs said, Christensen had not been charged but was a suspect in “a number of pharmacy robberies” in the Twin Falls area. News media accounts show that Christensen was a suspect in recent pharmacy robberies in several cities. The Times-News reported on Friday that Christensen was suspected of involvement in a March 10 robbery at the Kmart pharmacy in Twin Falls. The Post Register in Idaho Falls reported on Monday that Christensen was a suspect in a May 27 armed robbery at the Walgreen drug store in Blackfoot. Also, the Standard Examiner in Ogden, Utah, reported on Tuesday that Christensen was a suspect in an April 30 robbery at the Walgreen’s drug store pharmacy in South Ogden. If self-inflicted, Christensen’s death would be the third suicide at the Blaine County jail since the facility opened in 2008. The first suicide occurred on Oct. 17, 2009, when Cody John Finch, a 23-year-old Fairfield man, hanged himself with a bed sheet suspended from a heating vent in the toilet area of an isolation cell. Finch, who had been segregated from other inmates because of violent behavior, was awaiting transport to state prison for up to six years for a burglary conviction. Ramsey did not have an explanation regarding the number of suicides.